In recent years, a number of Pew Research Center surveys have shown that Millennials in the United States – young adults born between 1981 and 1996 – are generally less religious than older Americans, based on our core measures of religious commitment. 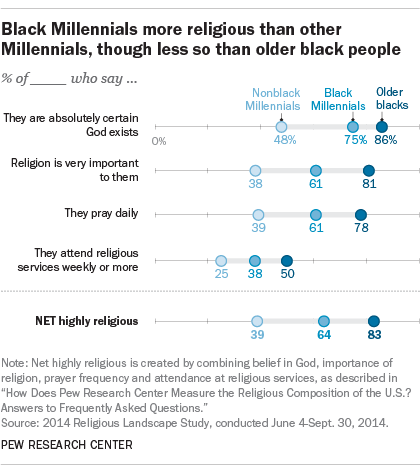 This holds true for black people, in that black Millennials tend to be less religious than older blacks. That said, black Millennials are considerably more religious than others in their generation, according to a new Pew Research Center analysis. About six-in-ten black Millennials (61%) say they pray at least daily, a significantly higher share than the 39% of nonblack Millennials saying this. And while 38% of black Millennials say they attend religious services at least weekly, just a quarter (25%) of other Millennials do this, according to the analysis based on data from the Center’s 2014 Religious Landscape Study. In fact, nearly two-thirds (64%) of black Millennials are highly religious on a four-item scale of religious commitment – which includes belief in God and self-described importance of religion, in addition to prayer and worship attendance – compared with 39% of nonblack Millennials. At the same time, black Millennials are substantially less religious than older black adults by these measures. They are less likely than older black adults to say they pray at least daily, that they attend religious services at least weekly, and that religion is very important to them. These patterns generally hold on several – but not all – of the other religious beliefs and practices measured by the survey. For example, the 61% of black Millennials who say they feel a deep sense of spiritual peace and well-being at least weekly is significantly lower than the 72% of older black people who say this, but higher than the 50% of nonblack Millennials. 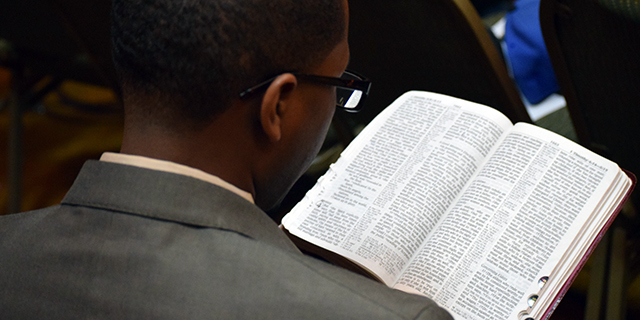 Black Millennials also are more likely to regularly read scripture outside of religious services than are others in their generation, and less likely than older black people to do so. In other instances, the patterns are more mixed. While black Millennials are more likely to believe in heaven than are nonblack Millennials, they are no less likely than older blacks to hold this belief. And respondents in all of these groups are about equally likely to say they feel a deep sense of wonder about the universe.